Atooi has confirmed release info and pricing for 3DS platforming adventure Chicken Wiggle. The game launches on the 3DS eShop on August 17th in North America and Europe, and will cost $14.99 / €14.99. The game's main campaign stars a young chicken and a wiggly worm, who have to work together to conquer a "myriad of perplexing platforming levels full of fun gadgets, tricky hazards, and sneaky foes". Outside of this mode you'll be able to create and share levels on-line, via the game's feature-rich level creator. You'll be able to choose different gameplay rules, themes, and even provide custom hints and tips for players. You'll be able to share your creations with other Chicken Wiggle players via the community portal, where level categories will include Official Atooi (made by Atooi level designers), Popular (most hearts), and Latest. You'll be able to input your own search tags or a specific level ID to locate certain levels. 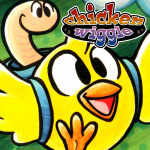 Have you been looking forward to playing Chicken Wiggle? Let us know with a comment. I am pretty excited about this game. Love myself a good puzzle platformer. Obvious wish it was on switch comment but I'm still most likely gonna pick it up! I remember people calling this the "poor man's Mario maker". It's funny considering that this one actually allows to share your creations online which is the point of these games and that makes Mario Maker the inferior version for me (3DS version of course). I'm looking forward to this. Stuff from Jools is usually always high quality. I do love me a good Jools Watsham game. Color me sold. ...got my chicken fingers ready!.. Yeah for some reason I thought it was on Switch. Right now Switch is the only console I have and it serves as both a portable and home console, except for my Wii U system that I kept for the hundreds of Virtual Console/eshop/WiiWare games I have on it. Would buy on Switch. Not buying any more 3DS games except Metroid and maybe Pokémon Ultra. Game looks solid though. Might get it somewhere down the line. Why is there so many articles about this game? Any particular reason? It just seems like one a day at this point. It pretty mush seems like a Mutatnt Mudds with a lots more of mobility and expanded design. It is just perfect fine for a good throwback platform! @justin233 I'm pretty much the same; I'm not interested in much on 3DS anymore apart from RPGs like Etrian Odyssey V.
This looks right up my alley. My 3DS is getting lots of use this year. Eager for Metroid too. I think the trailer does more harm than good. I'm sure it's going to be a great title, but that trailer is amateur hour. @AtooiJools I hope your game has a great reception. It's not much but you'll count with my purchase since day 1. @roy130390 Thank you! I really appreciate it. Day 1 purchase for me. @Damo - update your release info to include Europe, please! Wow same day, it seemed like forever to get Jools' other games in Europe. Not sure if its day one for me just yet since I have a ton on my backlog but I'll definitely pick it up in the future. Game looks good but I just don't see myself going to the tiny 3DS screen. If I had an XL then yes I could buy this eventually. But no money right now. Illustrations look great. The animation however looks uninspired.